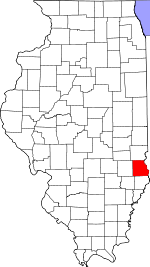 Lamotte Township is one of ten townships in Crawford County, Illinois, USA. As of the 2010 census, its population was 2,046 and it contained 995 housing units. Its name changed from Palestine Township sometime before 1921. According to the 2010 census, the township has a total area of 51.41 square miles (133.2 km2), of which 50.81 square miles (131.6 km2) (or 98.83%) is land and 0.59 square miles (1.5 km2) (or 1.15%) is water. The Wabash River defines its eastern border. The township contains these seven cemeteries: Barbee, East Union, Green, Higgins, Kitchell, Neathery and Oak Grove. "Lamotte Township, Crawford County, Illinois". Geographic Names Information System. United States Geological Survey. Retrieved 2010-01-10. This page was last edited on 23 February 2018, at 01:33 (UTC).